Michael Monsoor, a US Navy SEAL, led a distinguished career in the Navy: he earned a Bronze Star for his work advising Iraqi troops, a Silver Star for rescuing – under fire – a fellow SEAL that was wounded by the enemy, and was awarded a posthumous Medal of Honor for using his own body to shield fellow SEALs from an activated grenade. Monsoor had an opportunity to escape the grenade’s blast, but the other SEALs did not. Without hesitation, he threw himself on the grenade to protect his team and was mortally wounded in the process. His actions reflect great honor and credit upon himself and the United States Navy. Though I never had the privilege to meet Petty Officer Monsoor, I think I can accurately claim that the world is a lesser place without him. “From great actor and progressive campaigner to reactionary old fart who loved guns: everyone agrees it was a tragic fall from grace. But did Heston really make a dramatic political u-turn? Actually, no. From the 1950s to the 1990s, he remained rather consistent in his commitment to upholding America’s freedoms. It was his liberal critics in the gun control lobby on the east coast and in trendy parts of LA who changed their tune, and made a mad swing from liberalism to authoritarianism. How gun control came to be seen as a liberal cause is one of life’s great mysteries. In both the US and across Europe, fully paid-up lefties and progressives will tell you with pride, even pomposity, that the American authorities ought to disarm their populace and ban guns. Hat tip to David Hardy. I’ve received an email from Arizona State Senator Karen Johnson indicating that it’s unlikely that SB 1214, a bill allowing CCW permit holders to carry on college campuses, is going to be heard in the Senate due to scheduling issues. As such, it appears that this bill is dead. She indicated she’ll put out a notice later today regarding the status of the bill, but it doesn’t look promising at this juncture. I’ve always thought that tumbling cases is a bit like alchemy: dirty, range-weary cases go into a machine, a few hours pass, and gleaming, golden metal emerges, still warm from friction with the crushed walnut shells. The reloading process, including tumbling cases, is an intensely satisfying thing: I’m actually making something with my own hands – something that would not exist without my efforts. The fact that most of the process involves handling a shiny yellow metal is not lost on that primal part of me that stirs at the sight of gold. Yesterday, the range was without shooters, and quiet. It also happened to be a gorgeous, sunny day. Being empty is not a naturally tenable position for a range on a day like that, so this shortcoming was corrected by myself and about 14 other people from the University of Arizona. Quite a few of the attendees were previous shooters, but there were several people who had never fired any gun whatsoever: our Brazilian-born physics lab TA Regina, my astrophysicist friend Louis and his roommate Brody, fellow physics students Alex and Colin, and several friends of a few of the other attendees (I’m terrible with names). A photographer from the Arizona Daily Wildcat, the university newspaper (which has a greater circulation than many small-town papers), also attended. One of the attendees, John, is a faculty member at the university and a stamp collector. That is, he possesses several NFA-regulated firearms (each of which requires a tax stamp, hence the name) including a full-auto M4, a full-auto MP5 and several other such items. I have but one stamp, and it’s for the suppressor for my Ruger 10/22. While some pictures were taken, most of us were focused on shooting and having fun rather than taking pictures. I’ve included some of the pictures below. All the pictures from the event can be seen here. 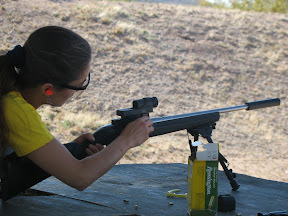 New shooters were started out on the suppressed 10/22, which helped them get comfortable with the mechanics of shooting without having to worry about recoil or noise. 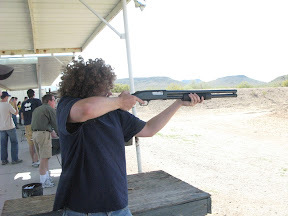 As they became more comfortable with each type of gun, they “graduated” to something new. 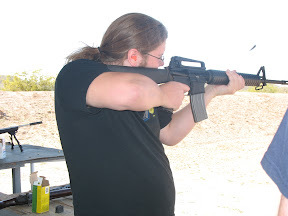 Many enjoyed the AR (with collapsible stock M4-type rifles being very popular with people of smaller stature). To those who question the necessity of collapsible/adjustable stocks on rifles, I urge you to look at this photograph. Doesn’t look very comfortable, does it? Regina’s not a very tall person at all (right around 5′ tall) and the fixed-stock, 20″ barrel AR is just too big for her to hold comfortably. 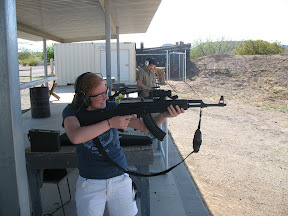 An M4gery with a collapsible stock and a 16″ barrel fit her much more comfortably, and she enjoyed it much more. The shotgun and the AK were also quite popular. 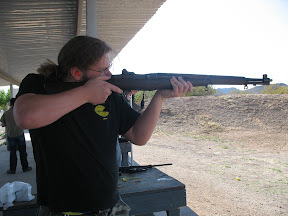 As was the M1 Garand. Alex is a big guy (he’s a former wrestler) and makes the M1 look small. While many shooters enjoyed the larger-caliber pistols (in this photo, Regina shoots the XD-45), the Ruger MkIII .22 pistol was the clear winner in the popularity contest — a satisfying amount of “bang” and minimal recoil make it one of the most fun guns on the line. I had several people inquire about how they would go about purchasing such a pistol, as they had so much fun with it. I really should get it threaded for a suppressor, as I’d imagine it’d be extremely quiet indeed. The best is saved for last — a full-auto MP5 (and later, M4) on a private “action shooting” range made for a exciting conclusion to the day. 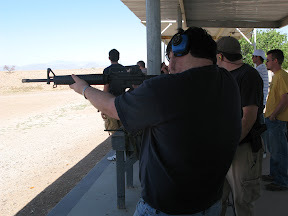 New shooters these days are lucky, getting to shoot machine guns on their first time out to the range. Maybe if more new shooters experience this, we’ll be able to get the 1986 ban repealed? The only downside to the day was that the Daily Wildcat photographer got too close to the scope on a .308 rifle, got beaned right between the eyebrows, and needed six stitches. Even so, he says he had a great day. In short: A beautiful day, an excellent range, and people having fun made for a most excellent outing. Top it off with two .50 cal ammo cans filled with brass (most of it .223) and an excursion to the local, non-chain pizza shop, and it ranks pretty highly on the list of “ideal days”. In a truly civil society peopled primarily by enlightened, sober individuals, the carriage of arms might be deemed gratuitous, but it is nonetheless harmless. In a society that measures up to anything less than that, the option to carry arms is a necessity. Well, I’m off to a fast start; I start a new blog, and already I have a shooting event tomorrow that I’ll have to write about. In keeping with the principles of Kim du Toit’s Nation of Riflemen, I arrange these events at various times to introduce new shooters to the shooting sports. I organized a similar event last year — pictures are available here — and it was a resounding success. A variety of students from the University of Arizona, mostly from the Physics and Astronomy departments, attended and had a great time. Most of the attendees were new shooters, and so enjoyed their time at the range that they’ve been telling their friends at the university all about the event. 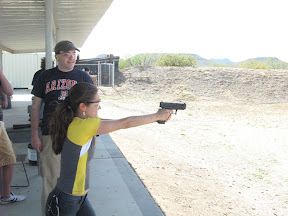 After a few informal, low-key sessions of “shooty goodness” out in the Coronado National Forest introduced a few more new shooters to the joys of recreational shooting, I figured that it was time for another event at the Tucson Rifle Club. I announced the event on Facebook last week, and invited several students (including the folks who attended the last trip), and now there’s 13 confirmed attendees. 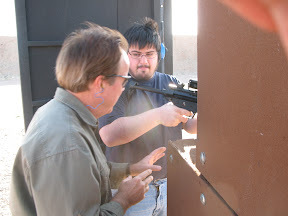 We’ve reserved a private range at the TRC from 1pm-5pm, which should provide sufficient trigger-time for new shooters. There’ll be several .22 rifles and handguns (including my suppressed Ruger 10/22) present to instruct new shooters, as well as a variety of other firearms including an M1 Garand, an AR-15, a Marlin 336 lever gun, a Remington 700 bolt-action rifle, and a full-auto MP5. This event promises to be a fun one, and I’ll do a full After Action Review over the weekend.